4 March 2015. Milo, a humanoid robot designed to engage and build social skills in children with autism spectrum disorder, was shown today at a press conference in Washington, D.C. The demonstration also reported on early research findings that suggest Milo can reach some children with autism to develop their social interactions. Autism spectrum disorder is a collection of neurodevelopmental conditions, marked by communication difficulties and impaired social interaction, as well as repetitive and stereotyped patterns of behavior. Some 1 in 68 children have autism spectrum disorder, according to Centers for Disease Control and Prevention, with males 5 times more likely to have the disorder than females. Classic autism is considered the most severe form of the syndrome. Milo is made by RoboKind, a developer of robotics for social engagement. Pamela Rollins, a professor of communications disorders at University of Texas in Dallas presented early results of tests with Milo and Robots4Autism curriculum for building social skills among children with autism spectrum disorder. 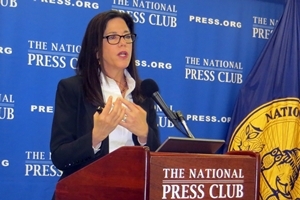 At the demonstration, held at National Press Club, Rollins outlined the curriculum, which she says reflects her research evidence and others. The curriculum has modules covering conversations, social situations, and emotional understanding, providing practical advice to children in simple interactions, like greetings, and more complex situations, such as birthday parties. Emotional understanding modules cover interpretation of facial expressions and understanding emotions of others. Milo is a two-foot tall humanoid robot with child-like facial features and voice, and whose arms move and facial expression can change as needed. The robot also has sensors to gauge eye contact — often a problem for children with autism spectrum disorder — as well as cameras and microphones to record interactions. The embedded software includes the Robots4Autism curriculum and components for reporting the child’s interaction and progress. Children and their therapists use tablets to interact with Milo, in addition to input to Milo’s sensors. Rollins says her research aims to build on earlier work assessing the feasibility of robots for helping children with autism, and develop a better understanding of the differences among children with the disorder in their levels of engagement with robots like Milo. She presented initial results of her study with 9 children, ages 5 to 14, all of whom had the skills needed to operate the tablets. Data collection, says Rollins, is still underway. The findings show mixed results for children with autism in dealing with Milo. Children in the study were divided into two groups based on their previous level of social responsiveness, and measured on their level of engagement with Milo or their student therapists. The results, supported by video of individual cases, show children with higher social functioning levels engage more with Milo when the robot initiates the interaction (88%), than when the children take the lead (81%). Children with lower levels of social functioning are only slightly more likely to engage with Milo when the robot initiates the interaction (68%) than when the children take the initiative (65%). Observations of interactions with the robots show higher-functioning children are more likely to interact with Milo as a friend, while the lower-functioning children took a longer period to warm up to the robot. Engagement with therapists alone, without the presence of Milo, is much lower among all children in the study — between 2 and 4 percent — across both social skill levels. Brad Baird, chief operating officer of RoboKind says the implications of tools like Milo for educators are significant. He cited data from Centers for Disease Control and Prevention that it costs $17,000 a year to teach each child with autism spectrum disorder. Early intervention strategies in children with the disorder, Baird says, can save the state of Texas alone some $2.9 billion. Editor’s note: Text updated, 6 and 9 March 2015, to give more recent data on the rate of occurrence for autism spectrum disorder and more complete results of the research presented at the briefing.